WHAT WILL YOU ACHIEVE WITH NEXT LEVEL NETWORKING? 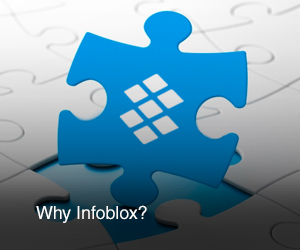 With Infoblox, you can deploy the blazing fast, high-availability, agile network you’ve always wanted. That opens a world of new opportunities for your business. Use our solutions to launch that next generation data center that’s now suddenly within reach. Easily ensure your security and compliance. Leave your competitors in the dust in the digital economy. Push the boundaries of what your network can achieve with our technology solutions for Microsoft and IPv6. Provide the network services your global customers demand with our solutions for key market segments. Infoblox Next Level Networking solutions help you address some of the most urgent network challenges your business faces in today’s hyperconnected landscape. When it comes to reaping the full value from your network investments, having the right technology solutions can make all the difference. Every industry has its own networking hurdles to overcome. Our solutions help you overcome them faster and more cost effectively.